Rescuers are still working to reach 181 miners trapped since Friday down two flooded coal mines in China's Shandong Province but hopes are fading fast. Torrential rain had caused a river to burst its banks, sending flood water cascading down an old shaft into the mine where the men were working. Rescuers are desperately trying to pump the water out but the chances of finding anyone alive appear slim. 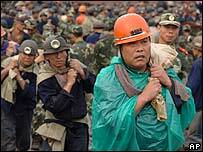 Chief rescuer Zhu Wenyu said he thought the miners had no hope of survival. The main mine affected, where 172 miners are missing, was completely inundated and many of the missing appear to be stranded far below the surface. Nine other miners are also trapped at a nearby pit. These accidents are a reminder that Chinese coal mines are among the most dangerous in the world, the BBC's Michael Bristow reports from Beijing. The breach in the dyke on the River Wen was finally closed on Sunday and pipes and high-speed pumps have been installed, state media report. Shandong's Communist Party chief, Li Jianguo, called for "no efforts to be spared" during the rescue work, according to state radio. Distraught relatives of the missing miners have been demonstrating outside the Huayuan Mining Company in Xintai City, 450km (280 miles) south of Beijing. Yelling abuse at guards, they tried to push their way through barriers after being refused access to the main flooded mine, and demanded that journalists be allowed to investigate properly what had happened. Ren Hua, whose husband is one of those trapped, told The Associated Press that she had been called on Friday and told there was no problem and that water was being pumped out of the mine. But when she arrived on Saturday with her 11-year-old son she found the pumping had not started. 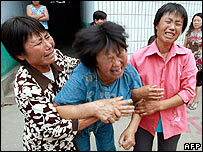 "We want to know how much work has been done and whether they are drawing off the water," she added, weeping. When the mines became flooded on Friday, amid flash floods brought on by rainfall of about 205mm, 584 miners managed to escape.